In the preschool and early school age children go through a stage of psychological and mental development, accompanied by great interest to the knowledge of the external world. And they seek to satisfy their curiosity in the form of questions to parents about the world. Mother and father should be able to explain to the child the essence of various natural phenomena, such as, rainbows. Adapt your story for the age and developmental level of the child. For example, the curious third-grader can tell you more about the physical nature of phenomena at he level, while four are unlikely to perceive this information. Tell your child about the weather conditions preceding the appearance of this optical effect. Explain that the rainbow appears after the rain. Consult the personal observations of the child, for example, ask if he noticed that after the rain the air is damp. If they agree explain that this is due to the fact that in the air at this time very many tiny water droplets. The next stage in the explanation resort to the figure. Draw on a sheet of paper a drop of water, on which a beam of light, and explain that the light reflected in it, gives her one of the colors. Then draw a rainbow and tell me what those colored stripes are the reflection of sunlight in small water drops. Can also add that a rainbow cannot be touched, it's just the light. The older child tell me about different situations in which you may see a rainbow. For example, his interest may cause a rainbow at the waterfall can be seen very often, because those little droplets of water, which saturated the air. 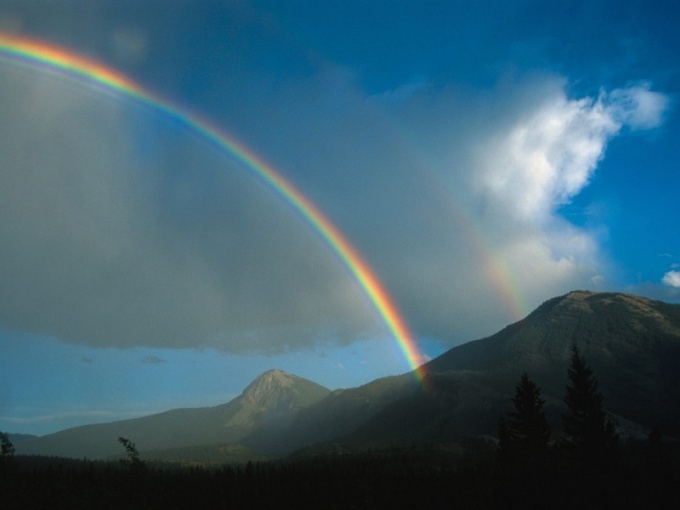 Also share with them information about what a rainbow can be seen even in winter. It happens very rarely, but in extreme cold, the light may begin to be reflected in smaller crystals hanging in the air. And the result is a rainbow in the shape of a ball - halo. If you do not remember the school course in optics, before speaking with the child re-read the relevant article in a textbook or encyclopedia. Younger students are not necessarily present in detail the refraction of light, but the explanation better to understand clearly the essence of the phenomenon.